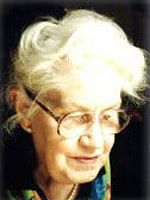 Dilys Carrington, who died in September, 2009, was regarded as the ‘quiet’ teacher of the Alexander technique world. Born in 1915 in Stourbridge, Worcestershire, she was educated at Kings’ High School for Girls, Warwick and Bedford College, University of London, where she studied Mathematics and Psychology. In 1938 she was taught by F. M. Alexander and later in the same year she became his secretary at Ashley Place, the home of his training course and private practice. Later Dilys started her teacher training with Alexander, completing it in 1960 with Walter Carrington whom she married in 1940. This began a very happy, collaborative partnership for sixty five years. In a moving tribute on the occasion of her 90th birthday Walter said “I do not think people realise just quite how much Dilys has done for the technique”. In the course of her career as a teacher of the Alexander technique Dilys became a very active member of the Society of Teachers of the Alexander Technique; she was, for many years, an elected and co-opted member of the Society’s Council. Her enormous interest in historical costume was reflected in her membership of the Costume Society. Dilys was always reluctant to speak publicly about the work to which she devoted fifty years of her life but her teaching made an enormous impact on every student. She would say “now just think that bit away from that bit nicely — nicely” as her direct hands, and fingers, indicated precisely what she intended. She was always patient with her students or “babes” as she called them. Never overbearing or fussy she nevertheless kept a keen eye on the beginners, making sure they were secure. As a teacher she displayed great qualities of patience and generosity; she always made sure that students understood what she was saying, even if that took time. There were moments when she found it difficult to conceal her irritation with people who “refused to use their brains” but the parameters of each relationship were always known. This stemmed from her inner confidence as a gifted individual who never resorted to any form of self aggrandisement. Her natural frugality was legendary. However the Constructive Teaching Centre benefitted from this approach over the forty nine years that she lived at, and ran, No.18. Somehow she managed to deal with the many demands of an older property and its associated training school within a strict budget. This thriftiness was also part of her general approach to life. It extended in period of draught to extreme care with the watering of the garden at No.18; there was always one eye on the water meter which resulted in the use of a bucket and not a hosepipe. However her generosity to individual students in times of need always took priority over economic considerations. Dilys was a great reader; in the last few years of her life her failing eyesight caused her some unhappiness mitigated a little by the use of talking books. These did not however replace the pleasure she had in reading a particularly loved Victorian novel, especially if a woman author, from her vast collection. Her visits over many years to Hay on Wye brought much delight always enhanced when the bargain box contained a volume not already in her own collection. Dilys gave short shrift to fanciful ideas. One student having had a lesson from her remarked that she felt that there had been something ‘Celtic’ in her hands. When this was relayed to her the reply was direct, “I don’t know anything about that but I do know I have spent the last forty five years working on my directions; that’s what she must mean”. The students who had the privilege to have had Dilys as their teacher in the Alexander technique experienced the certainty of her direction. Although she held no religious belief herself, her own spirit, creativity and direction was part of the gift of her life to them all. This straightforward, no nonsense, approach to their work will remain as a living example and inspiration to those who pass on her legacy to others in their work and beliefs. Dilys Carrington died 22nd September at Lansdowne Road. She is survived by her three sons, Christopher, Richard and Matthew.